Simonds Saw, Fitchburg, MA, a manufacturer of band-saw blades and files, announced that its European partner, Wespa has introduced the ability to produce instant blade-to-machine data transfer of machine-specific cutting parameters for its Individual Performance Cutting (IPC) custom-band-saw-blades program. 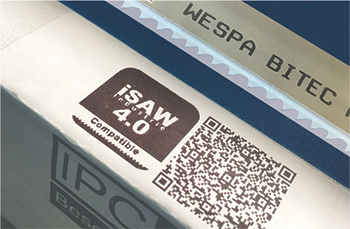 By using a mobile device and scanning a QR code on the saw blade or blade box, saw operators can point the scan to the machine to transfer a complete, unique data set so that the machine can begin cutting. IPC from Simonds Saw uses a band-saw blade-simulator program to reportedly improve sawing productivity by as much as 60 percent by significantly improving the performance, productivity and return on investment of a user's sawing operation. The simulator enables users to model their sawing applications and compare the results obtained with conventional saw technology to unique blade/tooth configurations designed specifically by Simonds/Wespa for users’ applications.